 Using imaginary conversations, NYU professor Cantor (Inventing the Middle Ages, 1991, etc.) 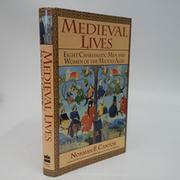 attempts to make medieval culture and society relevant for the modern reader. Beginning in the fifth century with Helen, mother of Constantine, the first Christian Emperor, Cantor guides us through the Middle Ages up to John, Duke of Bedford, in charge of the English army in France in 1427. En route we meet St. Augustine in North Africa, Alcuin as an old man at Aachen musing on his hopes for a Christian Empire under Charlemagne, Humbert of Lorraine and his dreams of a new order through papal power, St. Hildegard with her vision of femininity's role, Queen Eleanor of Aquitaine caught up in dynastic conflicts, and the scholarly ideals of the gentle Robert Grosseteste, bishop of Lincoln and first chancellor of Oxford University. Each chapter consists of a conversation bringing out the character of one of these figures. Cantor evokes the ambiances of each of the various epochs, and he enables us to enter sympathetically into the intense idealism of the people concerned even as we become aware of their limitations--as in the conversation among Augustine, his outspoken sister, and an old friend who has become a schismatic bishop. Cantor's dialogue is best when he is playing one idea off another, but he can be wooden when his characters inform each other of ``recent'' events. A serious problem, too, is his unabashed anachronism throughout. Thus we hear Helen discussing women's liberation, anti-Semitism, and religion in terms clearly familiar to the 1990's. This makes for stimulating reading, but since it is also supposed to be history, readers cannot feel sure whether or not they are being manipulated. On balance, a vivid exercise in narrative that is more ideological than historical.